Here is a shot of our follow-up assignment from the zoo visit. It's not pretty. At all. I took all the photos I had accumulated of the animals we saw and made stickers out of them. Then I had the kids place the stickers in the correct group on the very-quick-and-ugly-but-functional poster I whipped up. I quizzed the kids as we went along about the characteristics that determined the classification of each animal. Unfortunately I did not get any amphibian photos and only one fish photo so we just discussed the ones we saw. 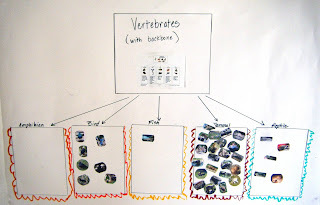 This project was a lot of fun and the kids now know these classifications backwards and forwards. 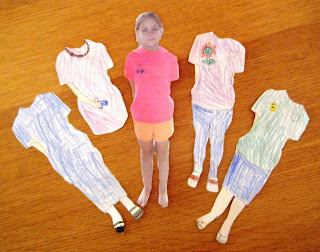 Sweet little Ellie made herself a paperdoll set a couple of weeks ago. At her request I took a picture of her and printed it. We have a small light box that has been around since I was a child and she used that to trace outfits over the photo. She colored them and cut everything out. I thought this was really cute. She did a good job on it but she gets so impatient with coloring! Fall is here. The weather is suddenly colder. We harvested the rest of the tomatoes and the pumpkins this week. This is the first year I've canned anything. So far I've done 5 pts of apple jelly, 17 pts of applesauce, 17 half-pts of grape jelly, 32 half-pts plum jelly, 9 quarts of spaghetti sauce with lots more to go. I'm also planning on canning pumpkin, salsa, and more spaghetti sauce. I'm pleased with my first foray into canning. To quote Isaac: "Holey Macaroni!" I love it! I really want to hear Little Man say "Holey Macaroni!" Your canning is impressive for a first attempt! Homemade spaghetti sauce is my favorite thing. What is a light box? Thanks for the comments Ladies. We're having a good time. Nina, a light box is basically a piece of translucent white plastic with a light behind it to make tracing easier. They are useful for slides and negatives too. You may have seen them in that context.